As part of Penn's Center for Programs in Contemporary Writing (CPCW), the Critical Writing Program strengthens the university's deep commitment to developing and refining the critical thinking, writing, and collaborative skills of our undergraduate students. Dedicated to teaching writing and to creating a community of writers across schools and disciplines, the Critical Writing Program brings together a uniquely discipline-based writing curriculum with dynamic out-of-the-classroom writer's workshops, symposia and readings; student-centered literary projects and publications; world-renowned Writers House Fellows; and Penn Senior Writing Fellows, distinguished writers and scholars, nationally recruited. 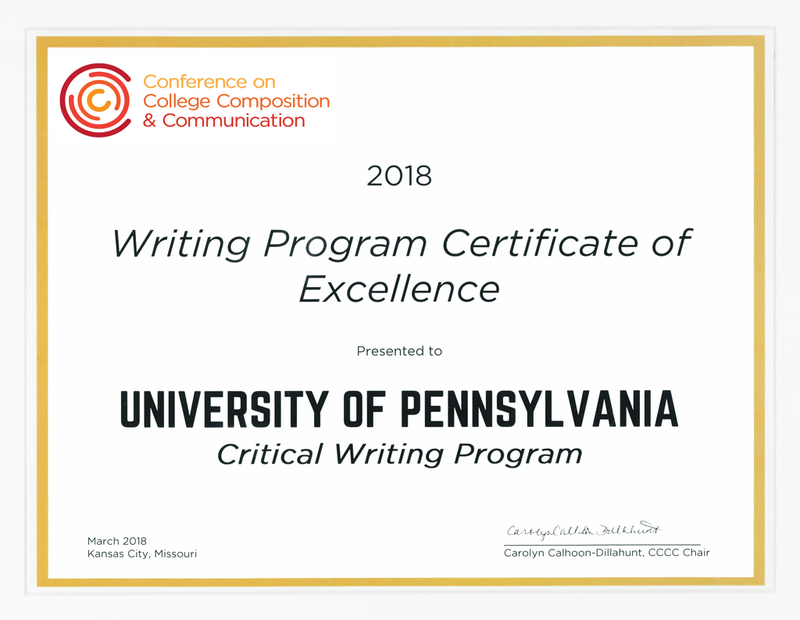 The Critical Writing Program is a recipient of the 2018 Conference on College Composition and Communication Writing Program Certificate of Excellence. Penn undergraduates across all four schools fulfill their writing requirement through seminars offered by the Critical Writing Program. They continue to advance their skills by enrolling in a range of writing courses and opportunities affiliated with CPCW. Undergraduates receive additional writing support and feedback from peer and senior tutors in the Marks Family Writing Center. Click here for a complete list of Critical Writing seminars.